The focus here will be on hardcover photo books (though some photo book companies may use the same interior paper for both softcover and hardcover photo books.) 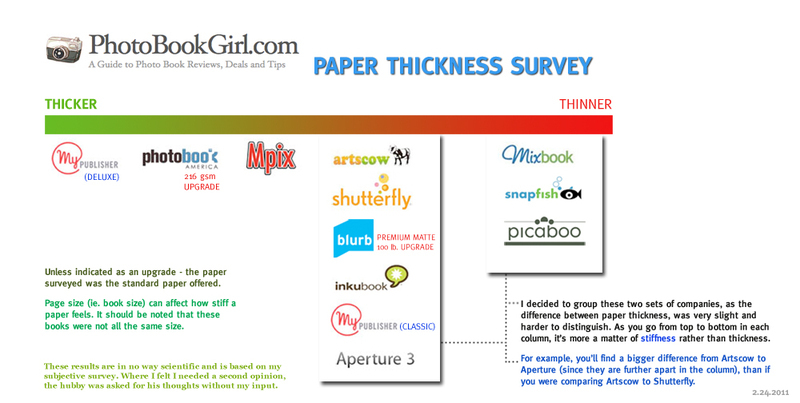 Also, the survey is on the average paper offered by most photo book companies as their standard paper (and in a few cases upgraded paper), therefore books that are printed on real photo paper or flush mounts are not included in this comparison. The contenders ranked in order of paper weight (arranged by from lowest lb. to highest, with those with the same weight listed alphabetically). These are the specs supplied by the company. If you want to read my more detailed review on each of the companies, you can click on the links below. What does the paper’s weight tell us? Without getting too technical, the weight in pounds refers to the weight of 500 sheets of a standardized size of that type of paper. In countries using the metric system “gsm” refers to grams per square meter. I used a printing company’s site to calculate the conversions from gsm into pounds. So, does higher paper weight automatically mean more thickness and higher quality? Not necessarily. If you take 100 lb. of text paper and compare that to 100 lb. cover paper, that doesn’t mean they are equivalent. Cover paper is typically heavier stock to start with. Also, there’s a matter of texture – a matte type paper usually feels different to the touch than a high gloss paper for instance. Stiffness of the paper also affects how thick a paper feels. For those reasons the numbers can’t tell us the whole story. I decided to pull out all the books and do a feel test. No calipers here. I know that it’s not “scientific” and it is going to be subjective, but this whole blog is based on my personal experience, so that’s all I can go by. Wherever I felt that it was too close to call, I asked the hubby to give me his opinion. Very scientific. Look for my new upcoming TV show – Photo Book Mythbusters! Weight & Stiffness – How thick does the paper feel? Does it bend easily? From the above set of books, it was very easy to determine which book had the thickest and sturdiest paper. Easily, MyPublisher’s Deluxe photo book – the largest of all the books surveyed at 15×11.5, had the thickest, most expensive feeling paper. At 182 lbs., in this case, the specs don’t lie. I decided to make my honeymoon photo book series in this big and beautiful size. Then, as you may expect, Photobook America’s upgraded 216 gsm/156 lb. paper was a close second. As mentioned in my Photobook America review, you wonder at first whether you’re accidentally turning two pages instead of one since each page is so thick. From there Mpix’s 100 lb. pearl finish is a close match to Artscow 106 lb. paper in weight, and I found Mpix’s paper slightly more stiff than Artscow’s paper. After that point, it was really difficult to rank the rest. From Artscow to Aperture the difference was very slim. The feel of the thickness of the papers were so similar, I had to try bending the pages to see how easily or difficult it was to bend and that’s how the stiffness factor came into play. So, from the middle of the pack, it goes from more stiff to less stiff, but very similar thickness overall. I therefore relied on the flex of the paper to rank them. From there, I would put Mixbook, Snapfish and Picaboo in a second group, as they were very close and hard to rank, again looking more at stiffness rather than thickness. Gloss/Sheen – The texture of the surface affects its feel. Is it shiny or matte? Some folks like a higher gloss paper as it arguably has a more “photograph” like finish. It’s like having a choice between gloss finish or matte finish on your 4×6 prints – you may have a preference, you may not. However, it’s important to note, of the books listed above, none of them come close to approaching the gloss finish of a photographic print, so that’s not what is meant here when I say a book has a glossy finish – it’s more about the level of reflectiveness. The most reflective is Mpix’s pearl finish. The paper also has texture in addition to the pearl sheen. Artscow’s paper in contrast is smooth and has the most reflective quality for a smooth paper. The printed photos themselves in Artscow also have a more glossy quality. The ink appears to sit on the surface of the paper, instead of being absorbed into the paper. Photobook America’s upgraded premium silk paper is the least glossy. I also assume that the standard silk paper is probably a matte finish as well, just at a lesser thickness. Another point to note is that Photobook America’s hardcover has one of the most matte finishes I’ve seen. So if you like a matte cover with a matte interior, Photobook America and Blurb are the best options to fit the bill. Again just as with the thick to thin spectrum above, when you’re looking at the middle of the pack, the differences are harder to quantify and are negligible. Recently a Facebook fan mentioned that she didn’t like glossy covers and wanted to know which photo book companies offered matte covers. When looking at full custom cover hardcovers (where your image takes up the entire cover), Photobook America, Blurb and MyPublisher have the most matte exteriors. Apple Aperture is in the middle with a semi-glossy cover (underneath the bonus dust jacket) and the rest have glossy covers. Mpix’s book has the smoothest and highest gloss cover. The other glossy covers do not give off a smooth reflection, the gloss reflects a textured surface. Inkubook was the one book I noticed which had matte pages but with a glossy cover. The top image is of the Photobook America/Photobook Canada matte cover and the bottom is of Inkubook’s glossy cover. You can see what I mean about the glossy covers not being smooth but rather reflecting off a textured surface. Opacity is also another factor that some folks pay attention to. I do as well, but because I tend towards black backgrounds, which naturally makes the page more opaque than if I used white backgrounds, I usually don’t have any problem with bleedthrough. Generally, thicker paper will mean higher opacity. I will mention opacity issues in my individual reviews if I feel it’s relevant, but I don’t recall any of these books – even the ones with the thinnest paper – having any bleedthrough issues. Another factor to note is that the size of the page could affect how stiff the page feels. A book at 5×5 size may feel stiffer than the same book at 11×8 for instance due to the tightness of the binding, so take that should be taken into account here. My books were not all the same size as shown in the chart at the top of the post. Summary – What’s the Best? Most folks would agree, the thicker the pages the better. Thickness implies quality. Thickness also means durability and a lesser chance of worn pages and creases developing over time. Deluxe is not “deluxe” for nothing though, you pay about twice as much for MyPublisher’s Deluxe book than their Classic size, but the thing is massive (and heavy due to the heavier weight paper). Other companies that make a similar size and style are Kodak Gallery and Mixbook. That may make an interesting comparison at some point. Overall, that I didn’t think that any of these books had “cheap-feeling” paper. As with both sets of criteria, especially towards the middle of the pack, it became very difficult to say one was measurably different from the other. Similarly, if you’re making a photo book as a gift, your recipient will be more focused on the photos and time and creativity that went into it rather than analyzing the quality of the paper (unless you have a very discerning recipient). Of course, paper quality will be more important for pros or when making books for more important occasions such as weddings or anniversaries, but for the average vacation photo book, it may not be as important. Most definitely there are differences in paper quality, but only when comparing one end of the spectrum to the other end will you really take significant notice of the difference. Okay, I’ve blabbed enough. Do you agree or disagree with the results of my paper survey? Please comment below! Awesome post and comparison! I think I’ll be using honeymoon pictures with my Photo America Groupon! wow… now i know why u got a headache after writing this post! 🙂 but it’s an awesome post, thank you!! now how about “actual photo print quality compared to on screen” post? or is there one already? i really want to know who’s photo print qualities are the best. i once ordered photos from snapfish, and the photos that arrived were far less quality than from Sam’s Club. that’s one worry about photobooks… how the quality of photos match up to. i heard Mpix has pretty good quality photos? Love the information!! SO helpful! I can tell you spent a lot of time sorting through and “feeling” each of them to test their quality. Thank you so much for putting this out there for us all!! Great resource! I was unable to look at your previous reviews for Blurb but my friend (who I gave a blurb gift certificate to) got a small book and i was extremely disappointed with their standard paper (80lbs). It felt like bond paper. Even the printing sort of suffered. Glossy or Matte / premium paper is the way to go. Great information..all in one place. Many thanks! I’d also be interested in hearing your thoughts on the companies who use real photo paper, etc. My current go-to for photobooks is adoramapix because I like that they use real photo paper, but I’d definitely be interested in hearing about rivals (I haven’t really researched any other companies that use photo paper). Yes, that will definitely be another post. So far, I’ve used AdoramaPix and MyPhotoCreations (the Ashbury may be of interest to you). b/t/w did you see today’s giveaway? The photo book products being given away are both on real photo paper! Also, Smilebooks prints on real paper, but I haven’t tried them yet. This is another example of your excellent research. Nowhere else can we get the kind of comparative reports that you do for photobooks. It makes it so much easier to guide my selection for each project! So far I have ordered from Shutterfly & Picaboo – I really like the paper quality. I can’t wait to get my photographer’s album with the really thick, sturdy pages. thanks for the comparison reviews. It is so nice to be able to see side by side which books have the features I want. It drives me nuts not to be able to customize layouts, so I like knowing up front if the company offers that feature. Hey PhotoBookGirl, I have used Winkflash.com to make loads of books. I notice they are not mentioned in any of your comparisions. Have you ever tried them? Thanks for this great review. I have ordered Snapfish books in the past but would like something with thicker/stiffer paper and less gloss. Your comparisons make it easier to select a different vendor for my next book. So cool to run across this comparison since I was deciding between 2 sites you spoke about. Hmmm, think I go with Photobook America. I felt and say someone’s book from Snapfish and just wasn’t impressed. Thanks for the wonderful review! This was really helpful in choosing a company to make our guestbook photo album with our engagement photos and they turned out beautifully! Oh I want to know too! Getting ready to make a photo guest book for my wedding and based on your review I’m thinking Photobook America as I assume that matte paper would be better for writing on. Would love to hear your suggestions if you have any! Thanks! Matte paper is safest, but with the right pen – you don’t need to be concerned. Black fine point Sharpies are the best. See my post on baby guest book here – these pages are slick and on real photo paper. Also, check out my wedding posts here and see my own wedding guest book. Best! i love your review! which companies can you remove the logo? i only know of apple books that i can remove the logo. Denise – I don’t have a search function for logos/no logos but if you click on the companies here, you’ll find that info in the chart. Best! 1.After all the work I put into a photo book recently, I’m inclined to get archival quality paper for the next one. Your thoughts? 2. I like the fact that I can create a photo book in my software (iPhoto) so that I have a digital copy of the book. Are there any companies out there that use archival quality paper AND let me keep a copy of my book on my laptop? 1) Most of the companies if not all state that the paper they use is archival quality. Perhaps you mean real photo paper? AdoramaPix uses real photo paper. Smilebooks and Artscow (Deluxe) offer that option in their product lines. 2) Most do not. The companies that do allow you to keep a copy of the book (you mean PDF or jpeg format right?) would be for proof purposes and they’d put a watermark on it. They let you use their software for free cause they want you to print a book with them 🙂 You could buy your own software. I know that MyPhotoCreations allows you to buy their software and then you can print it with anyone or buy Adobe InDesign or Photoshop but that costs a lot more since they are pro level programs. A great big thanks for taking on this monumental task. Your side-by-side comparisons are appreciated. Are you going to add Myphotocreations-Ashbury and the Blurb-Proline to your comparo as well? You have some other detailed reviews but it would be nice to have them all in the same place. This was so interesting and relevant. Thank you for putting in all your time and effort into this post. It’s post like this that remind me how helpful the internet is. Keep up the good work. I’m trying to figure out what paper to use for wedding albums for parents using Photobook America, but can’t seem to decide. What would you recommend? (we have groupons for Photobook America so for sure using). 190gsm Photo Lustre Paper – Thinking about this one – Thoughts? I like the photo lustre paper myself. If you look at my Photobook America reviews that may help you decide (under Photo Book Reviews, click on the company logo), I’ve tried the photo lustre and the 216 gsm premium silk. The Premium silk is thicker, but the lustre is more like real photo paper and has a nice sheen to it. Looks more upscale in my opinion. I’m glad to see someone out there making comparisons between the massive number of photobooks that are available these days. As a professional photographer, one of the things I constantly have to do is educate clients about the differences between books and albums, photographic paper vs. press paper, and the quality differences that range all over the map. I have used a number of these products. The Mpix deluxe is delicious, but this is not surprising to me. It’s a division of Millers pro labs, and their printing is always very good. I’m not a big fan of the lower-end ones, however. My personal favourite is from a pro-only lab: White House Custom Color (WHCC) which a lot of pros use for their printing. The covers are high quality, matte finish (but incredibly smooth) and the paper quality is excellent. There are two things I think need further discussion when you’re choosing a book. First, while paper weight is important, how does the paper hold up over time? I have seen photobooks whose paper became so wrinkled, prone to tearing and buckling just from turning the pages. Others hold up very well (WHCC and Photobook America are two examples). What about fingerprints? Some pages resist them well, others…they remain as visible as if you had turned the pages while eating a bucket of KFC. The other HUGE one is the binding. This is CRITICAL. So many of these companies glue their bindings, or do such a poor job of stitching their bindings that the ends papers quickly become perforated around the stitches, and begin to fall out. I’d love to see a comparison of how bindings held up after multiple openings and fingers rifling through the pages. One more thing about Photobook America – despite my location in New England, when I have ordered from them, the books come from Malaysia and not Canada. Still, DHL gets them to my door in 3 days or less. Thanks for sharing your experiences. Definitely longevity of these books are important. I actually haven’t had any problems with books falling apart yet since I’ve started making them about 6 to 7 years ago, except for the binding on the Mpix 5 x 5 book I got. I have photos of the cracked binding here: http://www.photobookgirl.com/blog/make-your-own-wedding-photo-book-part-ii/ and that happened the first time I opened the book. I heard that from another reader that it happened to him too. Other than that, my books have held up well – I do cringe however when folks are going through my books and not taking much care when they are flipping the pages – bending them and creasing the pages (arghh!) I’ve thought about making two copies of my favorite books, one to put on the coffee table and one to archive! Thanks for your blog. Really useful. Do you know if the colour fades in photo books over time, and if it does can you recommend which company and paper would be best to prevent this. Also, do you know of any good ones that would ship to Australia? Thanks! Most if not all state that they print on archival paper and use archival inks, so they are not supposed to fade for a very long time, in some cases about 100 years. As I consider myself old but have not lived to 100 years yet, I can’t give you personal experience but my oldest books are about 6 to 7 years old and I haven’t seen them fade. I did some online research and found that the trusted source of research in this area is Wilhelm Imaging Research. I specifically read this article on the the longevity of prints produced on HP Indigo digital presses since that is a common print press I’ve seen mentioned on many of the photobook company websites (can’t remember which ones off hand and some do not have information on the exact print process they use on their sites). It’s very interesting if you’re into that kind of technical stuff. Note that it doesn’t only matter what kind of paper but what kind of ink is used as well (not to add another variable to the mix, but you asked… 🙂 ) However, the most important thing is to protect your albums and any photographic materials by controlling the environmental conditions under which they are stored as best you can. Mostly common sense kind of tips: don’t expose to direct sunlight; don’t store in a humid, damp area like a basement; don’t store in areas subject to a lot of temperature fluctuation. I don’t normally look to see where a company ships, but that info is readily available in the Shipping or FAQs section of each site. I believe most of the companies ship to Australia. If it’s in your budget, I’d suggest a company that prints on real photo paper and possibly a flush mount album. See my blog posts on flush mounts here. Thank you for the very thorough review and a very informative blog! As a control-freak and a perfectionist, I have been reading reviews for days trying to decide which publisher (and hard/paperback, orientation, size, matte/glossy, etc.) to go with for my wedding photos and you definitely answered every question I could think of. Just in time for a Groupon to Photobook America! Thanks again! I’m glad to hear my site’s been helpful. Hope you love your book! I am looking to purchase photo book paper to use in my scrapbooks. I am in the process of switching to digital scrapping. I have several empty albums (They were on sale) I would like to fill. I have a wonderful wide format Epson Stylus 1400 photo printer. What paper would work best for me. Where can I find it? I have done some printing at home, but not much. I used to use an Epson printer, I know Epson made some nice paper – some with a photo paper type sheen and some matte. Sorry I don’t know much else though since I don’t print at home. Thanks for the feedback. I logged onto the Epson store site and found Scrapbook Paper. I ordered a couple of packs. I let you know if It was worth it. Thank you for your research, and for sharing the results with us. One aspect of paper selection was not mentioned here, and this is the paper resistance to moisture. I have a picture book printed on the 100lb matte paper. As the humidity became high, i noticed the pages are getting “wavy” at the edges. Do you know which paper withstands humidity best without showing signs of moisture absorption? Where can I find such info? Thank you so much for your insight. I am doing a photo gift book for my brother, using Blurb, 75 pages, and think I have narrowed down the paper choices to Proline Pearl or Premium Lustre/Matte. (not much narrowing-down!) Have black/white and color photos. Quality of pics very important. If cost was no object (it’s a gift! ), can you make a recommendation? I really need to get this ordered, but am paralyzed by this decision. What a nice gift! The matte is going to mute your colors a bit, so if you want the colors to pop, then I’d go with a lustre or pearl. Out of the proline papers, the pearl is my fave. If you’re still not sure, you can order a pack of paper samples from Blurb’s site. the other suggestion I have for you is to look at MyPublisher. I think they have really vibrant colors and very good picture quality. Here’s an overview and comparison of the two: http://www.photobookgirl.com/compare-Blurb-vs-MyPublisher/ Best of luck on your book! Hi! 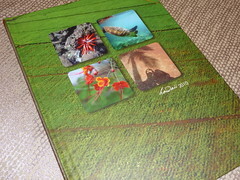 I have ordered several photobook America imagewrap photobooks…I love how they came out. I made the 170 gsm matte texture and also the 190 gsm photo luster. Are those books not archival? Does that mean that in a few years/decades or so the images will fade, turn yellow, etc? I believe most if not all companies are using archival ink and paper. Hi! I am planning to make my own guestbook via Photobook. The paper quality I am looking at is 170gsm premium silk paper. What kind of pens may I use on the book to prevent smudges? Is it a wise idea to use silk paper for a guestbook? Since the time I did that post, I also found another marker called the Zig photo marker. I haven’t tried it yet though, but it’s supposed to be photo safe and archival. I’ll probably update this post later. Best of luck on your book. I think the silk will be fine, just don’t pick anything too glossy and you should be okay. What does Silk 100# 4/4 mean in terms of covers? 100 pound silk paper, 4 color? Is that a thick cover associated with a hardback or a softcover? Self-publishing, trying to navigate the lingo. Hi Alan, is there a specific company you’re asking about? that’s probably a softcover if they are talking #. You wouldn’t normally give specs on a hardcover in that way from my understanding. Thanks for all of the information. I’m trying to find a photo book that uses tear-proof paper (like Tyvek). Have you heard of one? you may want to look into a flush mount or the lay flat upgrade on Shutterfly. AdoramaPix’s paper is “tear proof” since it’s fused to another harder core. Excellent research. I like MyPublisher. This is hilarious! Thanks for sharing your knowledge. Photo book paper is important to me and I like matte finish! Good to know someone subjectively tried these out.